Briefly: We now have a release date for Jon Stewart's new film Rosewater, which was filmed last year in the Middle East, and is already set for a big premiere at the Toronto Film Festival in September. Open Road Films has schedule Rosewater for a limited debut starting November 7th this fall, putting it right smack in the middle of awards season. Guess what else opens on November 7th? Nolan's Interstellar; not to mention Disney's Big Hero 6. It's up against quite a few films, but it might have the power to take some adult crowds to the art house. Stewart's Rosewater stars Gael García Bernal as BBC journalist Maziar Bahari, who was detained in Iraq for more than 100 days. We expect to hear more about this film soon, as well as a first look. Photo above is from costume designer Phaedra Dahdaleh's blog about working with Jon Stewart on the film. Update! We've added this new brand batch of first look photos from Rosewater above debuted recently by EW.com. 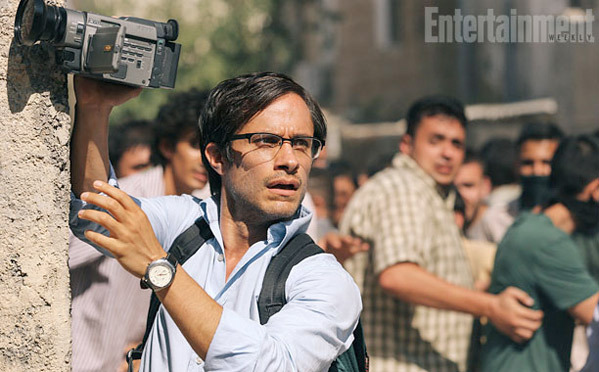 These two shots are Open Road's first officially released images from Rosewater, showing Stewart working with lead actor Gael García Bernal. Commenting on the project to EW, Jon Stewart explains, "it may not be what people expect from me; it's not a comedy." He adds, "I hope people view it for what it is—a love letter to expression and the importance of it. It's everything." Bernal plays Maziar Bahari, a real life journalist who's friends with Jon Stewart, and Shohreh Aghdashloo plays his mother. More on the way soon. He looks like my Rabbi is that little beard. Very excited to see this film.